Hello all, here is an update bulletin based on the minutes of our recent FOTA board meeting Conference call in February. Welcome to a report to keep you informed on past and upcoming legislative issues. 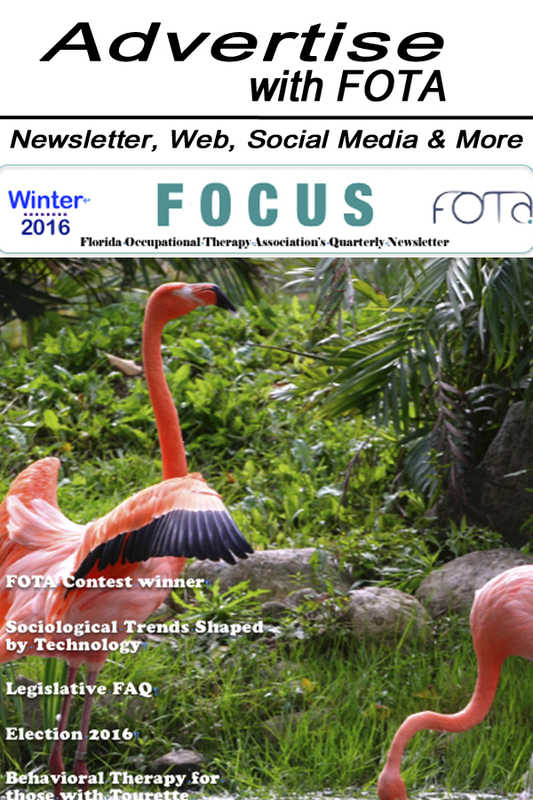 Part of you membership dues go to ensure that FOTA as skilled advisement from our lobbying firm on strategies to promote and protect OT in Florida. FOTA relies on membership support to advocate successfully. More members are needed to increase our ability to influence change. FOTA and AOTA members know how valuable their associations dollars are to represent their needs with legislators, regulators, accrediting bodies, and external threats to our profession. Both state and national associations address a wide array of topics that impacts on EVERY practice setting, EVERY demographic, EVERY insurance provisions, and EVERY diagnostic category that occupational therapists and occupational therapy assistants see in their work every day. WOW! This article in part demonstrates the value of your association dollars and calls on every state and national association member to ACTIVELY recruit others in our profession to join. Think for a moment: do you have auto insurance? Do you have health insurance? Do you insure your possessions in your homes with homeowners or renters insurance? If you own a home you pay for mortgage insurance, right? Do you have individual malpractice liability insurance? Do you have workman’s compensation insurance privately or through your employer? Do you pay for travel insurance sometimes? Do you have life insurance? Do you have flood insurance? Some people have death expenses insurance. Some people have pet health insurance. Right?? Pictured Left to Right are our voting board members and President-elect. Cathy Peirce, Ric Carrasco, Douglene Jackson, Tia Hughes, Kathy Frahm, Brent Cheyne, Elise Bloch, Debbie Misrahi, and Kelly Uanino. Interview with Region 5's Samarra St. Hilaire: On FOTA, Lobbying, and the Presidency, Leadership, Membership, and Professional Growth.